So the clock says it’s Tuesday, but I haven’t gone to bed yet, so maybe it can count as a Monday update? 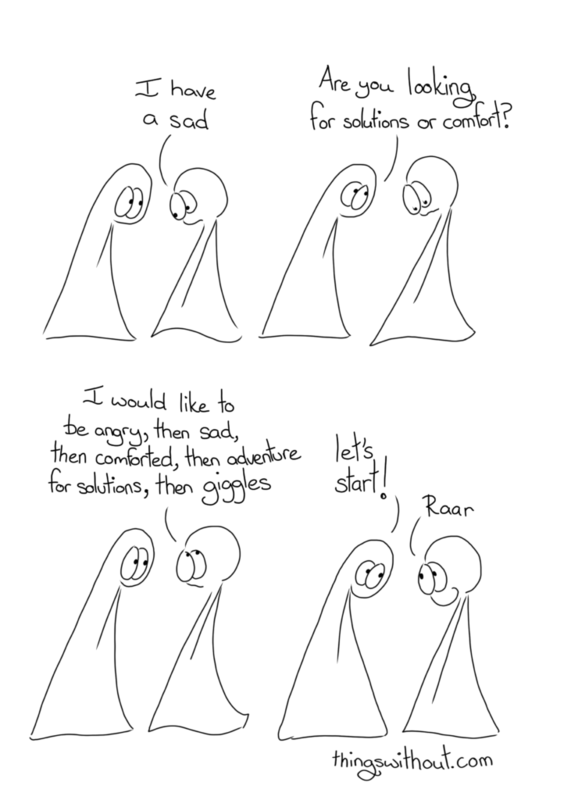 Thing 1: Are you looking for solutions or comfort? Thing 1: but I kept going and going until it even became fun! Thing 1: It was wonderful. This comic was inspired by doing something that scared me. I roller skate a lot indoors, but I have very little outdoors experience. While in San Francisco I went skating in Golden Gate Park with some friends. We skated down roads and steep hills and rough terrain we shared with cars. I was so scared and embarrassed, I’m supposed to be better at rollerskating! Fortunately we skated for a long enough time that I was able to face and get over my fears several times and that was an amazing experience. Nothing makes you acutely aware of how you stop as much as going down a hill (which was scary enough for me at the start), having a car come up behind you and needing to get out of their way and stop sharply between parked cars without hitting the cars. We started by skating up and down roads blocked off on Sundays, but then we skated the full length of Golden Gate Park… hanging out with cyclists and cars!